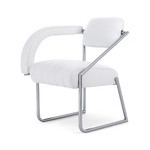 Eileen Gray did not want delicate luxury furniture for her house in Castellar, on the way from Menton to the Alps, but instead versatile pieces for everyday use. She succeeded with Menton in one of her most ingenious constructions. 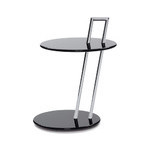 Through a simple rotation of the top one has either a low or a high table according to one's desire. 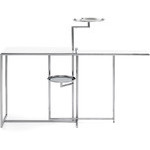 Eileen Gray used Menton in the high position as a dining table, in the low position as a side table on the terrace and also as a coffee table in the guest room. Authorized by The World Licence Holder Aram Designs Ltd, London. Menton can be pivoted to two different heights. 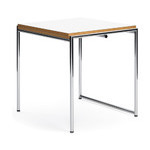 It is offered with a chromium-plated steel tube frame, the table-top has a linoleum surface, black on one side and grey on the other, with solid beech wood edging. 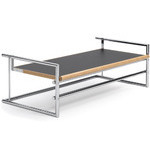 $4,283.00 + free shipping in the continental U.S.